The art of producing mud silk has been kept alive in the Guangdong Province of China, dating back to the fifth century Ming Dynasty! In this region, where river deltas have a special iron-rich mud that binds to the silk, mud silk is made through an organic, complex, season specific process that creates a specific surface look and texture. The result is a semi-opaque, lightweight, stain-resistant silk that is cool to wear. 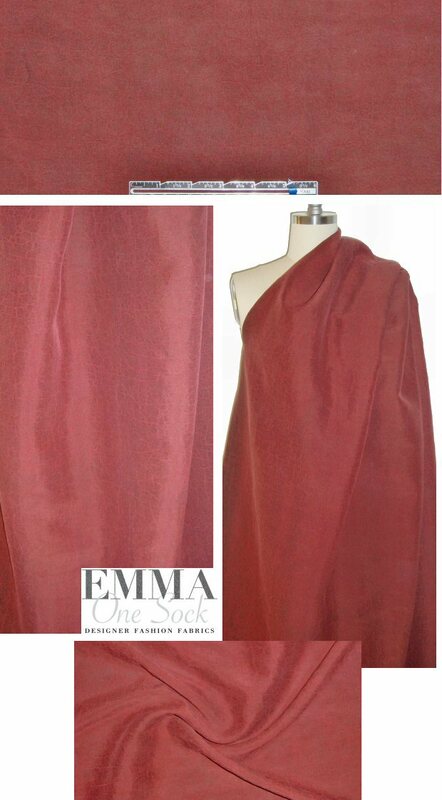 It has a lot of body in the drape and is perfect for a structured jacket, dress, topper coat, vest, overshirt, and more. The color is a rich brick red (PANTONE 19-1334 is close) and the back is a deep mud-black tone. Variations in color or weave are characteristics of this fabric, adding to its beauty and texture. Dry clean, or test first if you wish to hand wash and hang to dry.